I was at my hairdresser the other night when her son and daughter left to meet friends for dinner. My hairdresser’s shop is in her house. And her house is in the country. Way out in the country. Trey and Mandy (not their real names) were gone for less than three minutes when they pulled back into the driveway. Trey’s car looked like this. A deer ran into them. A buck to be more precise. 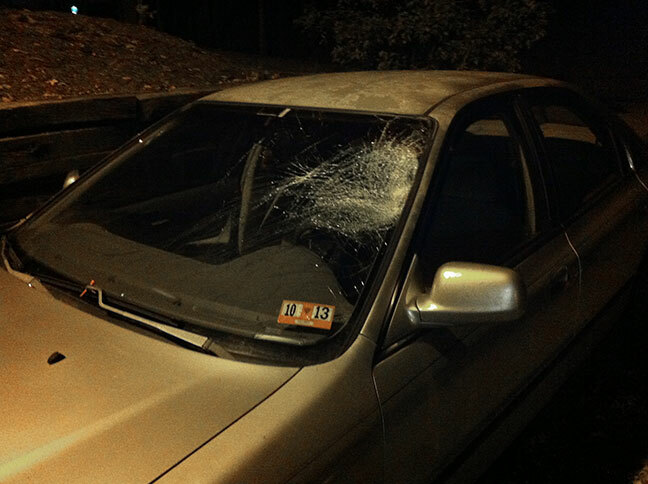 Deer have a tendency to run into moving cars. Evidently they must think they can out run and/or jump over the car. Fortunately neither Trey nor Mandy were hurt. Can’t say for sure what happened to the buck but I don’t think he made it from the looks of the damage to the windshield. This entry was posted in Random and tagged deer, random thoughts by Patti_is_knittinginflashes. Bookmark the permalink. My husband hit a deer last month (though he tells the story like the deer hit HIM) while driving MY car. The deer did not survive, and neither did my car, so now I’m driving a new Prius. Love the gas mileage, but really miss my Rav 4. Good thing the kids were not hurt. It is very possible that the deer really did hit your husband. This time of the year they have only one thing on their minds and it’s making more deer! I hope your husband wasn’t hurt. Mr. Aitch has had two deer incidents and both involved my cars. The cars had minor damage. My hairdresser’s son was pretty mad about his damaged car but at least it can be repaired easily. Well, at least “Trey” hadn’t already gotten his state inspection done! Looks like he is due this month! By the way, I’ve seen three different bucks around our house in the past week. I have no idea where they came from, as I haven’t seen any since last hunting season.